Looking good....what did you do with the head that was on the pole?? The impaled head on the pole would have been perfect for orcs, BUT I plan on playing with my 8-yr-old daughter. She thought the head was too creepy. I thought that the replacement pole arm looked appropriately "orcy". Should be interesting! I was thinking about doing LOTR army for HOTT or DBA, I just can't decide if I want to go with 15mm or 20mm. Atom Kid, 15mm is too small for my likes, but you should check out Splintered Light's site and also Din of War blog. He has a lot of Grenadier 15mm models to see there there. 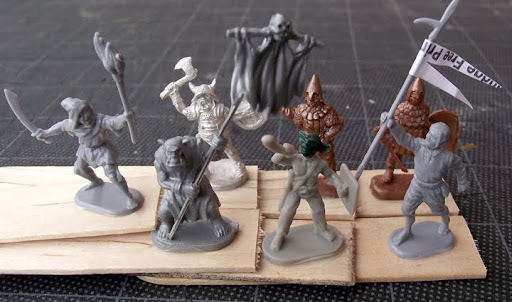 Since monsters come in all sizes you could probably mix 15mm and 20mm models in a lot of instances. I'm looking forward to seeing how you progress with these. Also, have you seen/considered the 1:72 orcs by dark alliance/orion? Thanks. I have seen the Dark Alliance models. I would be keen on having the drummer and horn-blower, but I'm not too enthusiastic about the rest of the poses. I'm not a big fan of Peter Jackson's goblin armor designs, which they seem to follow.